The easiest way to get to our school is to take the 69K Public Light Bus from Sha Tin Station. Alight at the junction of Lai Wo Lane and Sui Wo Roads. There is no car parking available on site unless by prior arrangement. If you are driving we advise you park at Fo Tan and take either public transport or a taxi up the hill to the school. If your child is absent from school, please inform us by sending a message to absent@sjs.esf.edu.hk . Please check the ‘Communicable Diseases – Recommended Sick Leave Period’ under Communications > Medical Service. At Sha Tin Junior School we are committed to providing a variety of extra-curricular activities for our pupils. Our school facilities are used by both ESF Educational Services and other private companies offering activities for children. Both of these private groups pay the school for the use of our facilities. Any extra-curricular activities that take place on our school premises outside of school hours need to enhance the experiences of our pupils and support the school curriculum in both content and teaching style. The use school facilities by all private providers will be carefully monitored and managed in order to minimise disruption to the school learning environment. All providers must have appropriate certifications and qualifications. All providers must have Public Liability Insurance cover and are fully responsible for the safety and supervision of their pupils. At the commencement of the school year all extra curricular providers are contacted by a member of the Sha Tin Junior School administration team. The purpose is to discuss the activities/mutual expectations/school policy on extra curricular lets, ratify insurance cover and the procedures for supervision and safety of students. A copy of insurance cover is to be provided to the school before any programmes commence. The commencement of any additional extra curricular programmes during the school year are subject to negotiation and managed on a case by case basis. All providers are expected to negotiate times, dates and schedules with a member of the Sha Tin Junior School administration team prior to the commencement of the school year. All providers will be expected to sign a hire agreement which will outline the school’s expectations and policy on extra curricular activities. Evidence of insurance cover and other terms and conditions will be required as part of the agreement. 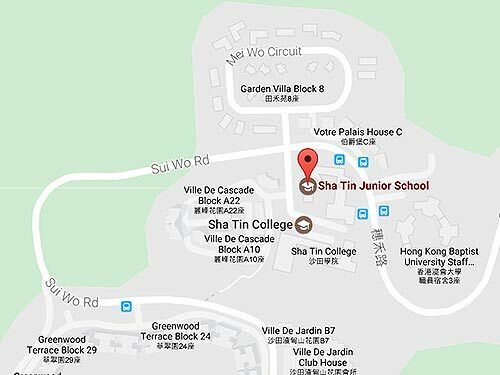 Sha Tin Junior School will distribute enrolment form provided by our external providers on Fridays only. An administration fee will be charged for the distribution. We are unable to provide any further support in recruiting students. Any requests for the hiring of school facilities should be made to Ms Monica Chan, Manager – Administration & Operations.